The most popular logic puzzle in the world! Each puzzle consists of a 9x9 grid containing given clues in various places. The object is to fill all empty squares so that the numbers 1 to 9 appear exactly once in each row, column and 3x3 box. Each puzzle consists of a 4x4 or 6x6 grid containing given clues in various places. The object is to fill all empty squares so that the numbers 1 to 4 (for 4x4 puzzles) or 1 to 6 (for 6x6 puzzles) appear exactly once in each row, column and box. Each puzzle consists of a 12x12 or 16x16 grid containing given clues in various places. The object is to fill all empty squares so that the numbers 1 to 12 (for 12x12 puzzles) or 1 to 16 (for 16x16 puzzles) appear exactly once in each row, column and box. Each puzzle consists of a 6x6, 9x9 or 12x12 grid containing given clues in various places. The object is to fill all empty squares so that the numbers 1 to 6 (for 6x6 puzzles) or 1 to 9 (for 9x9 puzzles) or 1 to 12 (for 12x12 puzzles) appear exactly once in each row, column and irregular shaped box. Each puzzle consists of a 9x9 grid containing given clues in various places. The object is to fill all empty squares so that the numbers 1 to 9 appear exactly once in each row, column, diagonal and 3x3 box. In the case of Diagonal Sudoku with Odd or Diagonal Sudoku with Even, the rules should comply with OddEven Sudoku as well. Each puzzle consists of two or more Sudoku grids overlapping each other in various configurations. 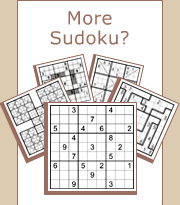 The grids may be Classic Sudoku or a mix of different Sudoku variants. The object is to solve all grids according to their variant rules. Note that overlapping areas comply with the rules of more than one grid. Each puzzle consists of a 9x9 Sudoku grid containing areas surrounded by gray or dotted lines. The object is to fill all empty squares so that the numbers 1 to 9 appear exactly once in each row, column and 3x3 box, and the sum of the numbers in each area is equal to the clue in the area’s top-left corner. In addition, no number may be used in the same area more than once. Each puzzle consists of a 9x9 grid containing given clues in various places, and one or more of the given clues are located in gray squares. The object is to fill all empty squares so that the numbers 1 to 9 appear exactly once in each row, column and 3x3 box, and all gray squares contain either odd or even numbers according to the given clues. Each puzzle consists of a group of circles arranged in a square grid and containing given clues in various places. The object is to fill all empty circles so that the numbers 1 to 4 (for 4x4 puzzles), 1 to 5 (for 5x5 puzzles) etc. appear exactly once in each row, column and chain.